At first, the Kik mobile app by Kik Interactive appears to be little more than just another messaging app for smartphones and mobile devices. Users can chat on it the same way they would with WeChat, WhatsApp and Facebook Messenger. However, there is a lot more to Kik, and it continues to grow in popularity. Kik Messenger is a mobile application where users can chat with one another over an Internet connection. This can be accomplished both over a 3G/4G cellular connection or over Wi-Fi. Offered as a free download, Kik can be used for multimedia conversations. Users can choose to share pictures, videos, memes, GIFs and other content, as well as basic text, through both one-on-one discussions and group chats. Unlike some other chat and messaging apps, Kik does not require the user to provide a phone number; all you need is a user name. The other main differentiating factor is that Kik features a built-in web browser where native apps can run. Developers can publish these internal apps and empower users to listen to music, watch videos, or interact with other specified web content. 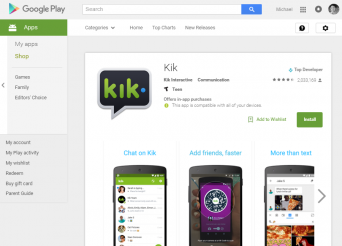 The Kik mobile app is available for three major mobile platforms. The functionality is virtually identical in all three versions of the app. All versions of Kik are free to download and use. It is cross-platform compatible, meaning iPhone users can chat with Android users without complication. Similar to Snapchat, Kik is most popular among younger users, including tweens, teens and young adults. This is a demographic that has been shown to value anonymity online. According to statistics gathered by DMR, Kik has 275 million users as of February 2016 with 50% of users sharing content each day. Kik Messenger users come from 230 countries around the world, though over two-thirds of users are in the United States. An estimated 40% of American teens and young adults are using the app. Kik boasts many features that make it particularly compelling among younger mobile users. Anonymity: Users do not need to provide a phone number and cannot be found by any means other than their chosen user name. While the registration form asks for a date of birth and states that users must be at least 13 years of age, none of this data is verified. Multimedia conversations: In addition to text-based chats with friends and contacts, users can send photos, videos, memes and other multimedia content. Native apps: Internal applications can be run within the Kik Messenger app itself. These apps, which feature Kik Optimized Pages, include access to online content plus the ability to play music, games and videos. There are also internal dating and social apps. Profile quick code: Similar to Snapchat's ghostcode, Kik also provides users with unique QR code-style 2D barcodes that make it easy for friends to be added to a contact list. These Kik 'Chat Codes' can also be used to access digital coupons and exclusive offers. Promoted chat accounts: In addition to individuals with personal Kik accounts, the mobile messaging platform also has accounts from companies and brands that are meant to connect with consumers and customers. Examples include MTV and Gramercy Pictures. This is one of way Kik monetizes its platform. No data plan needed: Kik accounts can be accessed via a Wi-Fi connection, so the app can be used on non-cellular devices like the iPod touch or Wi-Fi-only tablets. Concern has been raised, particularly among parents, regarding the relative safety of the Kik mobile app. These worries largely arise due to the anonymous nature of Kik chats and connections. There are stories like that of a 13-year-old girl who was kidnapped and murdered after chatting with an 18-year-old man who posed as a teenage girl. It is likely the platform may have also been used for other forms of victimization and exploitation, particularly of a sexual nature, among underage users. It is understandable that parents may think that Kik is dangerous for their children. In an interview for theguardian.com, National Cyber Security Alliance executive director Michael Kaiser emphasizes that parents should provide an open channel of communication for their children. This is particularly true in the environment of an anonymous app, especially one accused of providing inadequate parental controls. In addition to the potential threat of child predators, Kik is also gaining an increasing number of chat bots that are designed to help sell products to teens. While this may not necessarily raise concerns over safety, it does bring authenticity into question. The rising popularity of Kik, particularly among teenagers, cannot be denied. It provides a wealth of features and functionality that go beyond what may be found in competing mobile messaging apps. Controversy in the news has not deterred this growth and parents are encouraged to remain vigilant to ensure the safety of their children.